While much has been written about the “New Atheist” phenomenon, including two recent contributions on this site from Tenzan Eaghll and Donovan Schaefer, I had not fully appreciated the reasons for its enduring appeal until participating in a sermon among the faithful. The first thing that I noticed about Grayling’s narrative is that it was reactionary through and through. Grayling began his lecture by noting how it was commonplace in England for people to believe in fairies until quite recently, and that they were seen as the cause of much chaos and misfortune (why even Sir Arthur Conan Doyle believed in them!). This antiquated belief, thankfully, has largely faded away. We have a better understanding of causation now, including advanced knowledge of the human mind, which has accordingly led to a radical decline in the belief in fairies. Steeped in British empiricism, and the tradition stemming from David Hume in particular, Grayling’s primary method is to submit everything to rational proposition (ratio: referring to proportion: a proportional response to evidence). Relying on such methods as deductive inference (e.g., one can be confident that the sun will rise again tomorrow as it always has, though one can never be certain that it will) room for doubt is always present, where the reasonable thinker remains open to being proven wrong if better evidence should arise. Grayling told his audience that he prefers the term “non-fairyist” to atheist to describe his own position, as it better illustrates the absurdity of believing in something that the vast majority of people now know to be untrue. Since to claim that fairies exist is absurd; eo ipso to believe in God is equally foolish and with social consequences that are much the same, ranging from private folly to public disaster. From this it follows that religion is merely bad science—it impedes rational thought by relying on outdated modes of “belief,” which are not submitted to what we now know about the natural world (e.g., scientific hypothesis about origins, causation, etc.). Religious beliefs therefore prevent our ability to reason. Unfortunately, we are faced with the stark reality that what religions (read: scriptural adherence) cause people to think does have consequences in the real world. 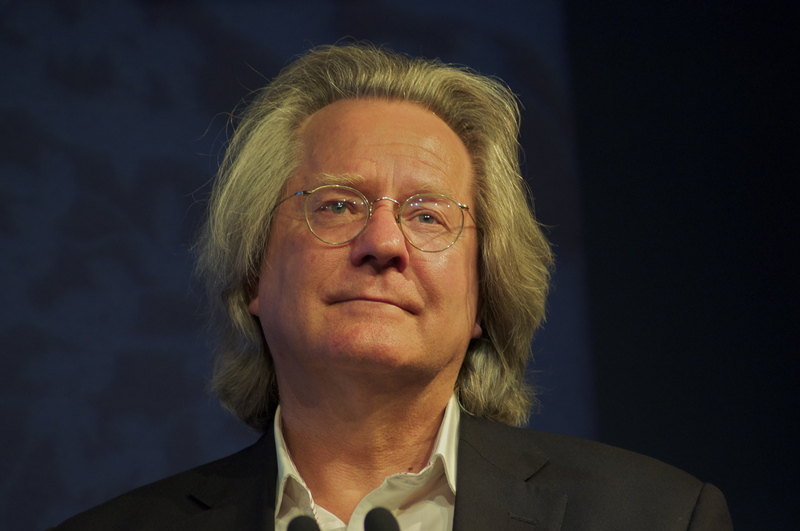 As a popular philosopher and a “New Atheist”—he cites Richard Dawkins, Daniel Dennett, Sam Harris and the late Christopher Hitchens as “friends”—Grayling noted that he often debates theologians and representatives of various traditions within the public sphere, typically serving as the “token atheist” on discussion panels on questions ranging from the existence of “God” to the influence of religious groups within the realm of politics. On matters of public policy, for example, he pointed out the startling contradiction between statistical evidence in Britain, citing that only 3% of the population attends “church” regularly, while the Church of England continues to be sanctioned by the state. More troubling still, there are currently 26 bishops sitting in the House of Lords, unelected and casting undue influence on matters of public policy. These groups and individuals are likened to lobbyists or special interests, whose influence is based not on an accurate reflection/representation of the British public, but upon the weight of tradition still casting its shadow over an otherwise (more) enlightened society. I am not particularly interested in empirical arguments for the existence of God(s), which in the Euro-West is typically the domain of theologians and analytic philosophers, though I do appreciate the existence of such discourses within the public sphere. Like many people, I share Grayling’s concern with the sometimes dubious role of confessional communities within politics, and was rather surprised to hear about the number of bishops still serving in the British House of Lords. In a similar vein, where I come from in the province of Ontario there still exists a separate Catholic school board funded by public dollars. As a matter of public policy such lingering sectarian influence certainly does raise eyebrows regarding issues of taxation, questions of inclusion and exclusion, and so forth. The problem with Grayling’s argument begins to reveal itself when he takes the leap from a critique of certain propositions that can be found in religious texts or in “folk” traditions, to a reification of “religion” as an obvious and tangible thing that not only remains antiquated in its outward expressions (at one point he likened prayer to living one’s life according to astrological readings), but is practically singular in its’ public use of reason and thus its’ social effects. The effects that followed from Grayling’s line of reasoning were a series of reductive, historically inaccurate, and Eurocentric propositions: that Muslim men who turn violent are merely lashing out against the pangs of modernity; that all religions except for one (Christianity) have founders who advocate a plurality of wives; and that the religions of Rome and Greece were different because they were about social cohesion, and not adherence to superstitious beliefs. The second thing to note about Grayling’s narrative is that it is a form of advocacy that seeks to affirm the factual correctness of atheism, the value of humanism and the importance of secularism as accurate and superior modes of belief and ways to order society. Putting aside the validity of his arguments when it comes to matters of metaphysical proofs, determining causation, etc., Grayling’s brand of secular humanism acts like many other self-identifying social formations by demarcating boundaries of inclusion and exclusion and by caricaturing those that are perceived to be opponents of said worldview as entirely Other, existing outside of the hallowed fold (though certainly welcome to enter if they are willing to submit). Not surprisingly, those who profess a post-traditional form of religion (as many main-line Christian groups do, for example) are merely “cherry picking” from an ever-decreasing basket of traditional resources. Notions of the hybridity of religious formations and their imbrications in cultural and political affairs (to say nothing of the overall instability of a signifier like “religion” in the first place) must be pushed to the side, lest the isomorphic bond between irrational propositions contained within scriptures and their effects on human actions comes undone. During the Q&A I had the opportunity to ask Grayling about how he squares the immense plurality of confessional positions with his own simplistic reductions, and wondered whether he was alienating potential allies in his humanist quest who likely share many of his ethical-political ideals. His response was as short as it was alarming. To paraphrase: “yes, there are of course moderate voices, but what I’m saying is that they don’t need these beliefs anymore, so why not give up the ghost?” My second question, addressing the blurred lines between confessional adherence and various cultural-political practices (e.g., the current debate in Quebec over the display of “religious symbols” by public employees) was said to be too “complicated” to address in a Q&A, though he did manage to point out that in Muslim-majority countries these lines are not recognized at all. This line of attack not only supports the modern misunderstanding of how religion influences society, but sidetracks the analysis of the various political, economic, historical, and cultural forces that are essentialized as religion, and which, if properly analyzed, could help alleviate the societal conflicts that propagate themselves under its name. Like “the Jews,” Islam is assigned an essence, a set of macro properties that are radically determinative of how individual bodies, communities, and nation-states will operate. What is missed in these calculations, among many other things, is how discourses about religion are always tied to the social interests of different groups—atheists, theists and religion scholars alike—and that the narratives of dominant groups both past and present (i.e., white men of European origin) hold disproportionate sway when it comes to setting the terms for debate and the social position required to have one’s voice heard. This is why somewhat recent innovations in feminist theory, post-colonial studies and cultural anthropology are so important—so that the varied positions, experiences and cultural locations of marginalized groups can gain a voice in the conversation, and perhaps even lead it. All of this leads me to affirm a “belief” that I have long held. While we can never avoid “ideological clannishness” in our scholarly endeavors, to quote Kate Daley-Bailey’s wonderful turn of phrase from this past Monday’s post, nor separate ourselves from the broader political implications of our theorizing, it is essential that we reveal our theoretical choices when addressing topics like religion—and not only to point out our own various location(s), but also to let our audience know that we are aware of the many other important positions, methods and theories that must also be considered. To ignore such interests in one’s theorizing is to follow the path that most appeals (or perhaps most pays-off? ), which is always a danger as one’s audience of devotees begins to grow. This entry was posted in Politics and Religion, Religion and Society, Religion and Theory, Theory and Method, Theory in the Real World and tagged A.C Grayling, Christopher Hitchens, David Hume, Donovan Schaefer, Kate Daley-Bailey, New Atheists, Richard, Richard Dawkins, sam harris, Tenzan Eaghll. Bookmark the permalink.